The twenty-two essays in this collection examine a wide scope of past and present cultural interrelations in the Americas. Exploring mutual gazes, separations, and linkages, this volume highlights regional, national, and transnational contacts in the New World; it raises awareness of the contrasts that separate American cultures; and it examines the confluences of New World issues, traditions, and practices. Contributing to the emerging field of Inter-American Studies, this collection increases our theoretical understanding of cultural hybridity and it demonstrates that cultural hybridity is by no means a recent phenomenon in the Americas. Raab, Josef, and Martin Butler, eds. Hybrid Americas: Contacts, Contrasts, and Confluences in New World Literatures and Cultures. 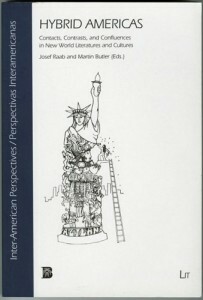 Inter-American Perspecties/Perspectivas Interamericanas vol. 2. Münster: LIT Verlag and Tempe: Bilingual P, 2008.